Birds around aircraft or at the airport are a problem. Pilots can be severely distracted when a bird hits or comes in the middle of flying. There have been cases when aeroplanes have been forced to land because of a bird hit. But recently an entire aircraft was slowed down by a flamingo who walked on the tarmac. Passengers of a flight to Spanish island, Palma de Mallocra Airport were received by the pink bird who was casually strolling on the runway. The easyJet flight had just made a landing when the ground staff contacted the plane's pilots to inform them of the flamingo just a few yards away from the plane. The incident was caught on video and was shared on social media and the funny video is now going viral. Owl Found In Cockpit of Jet Airways Boeing 777 at Mumbai Airport. 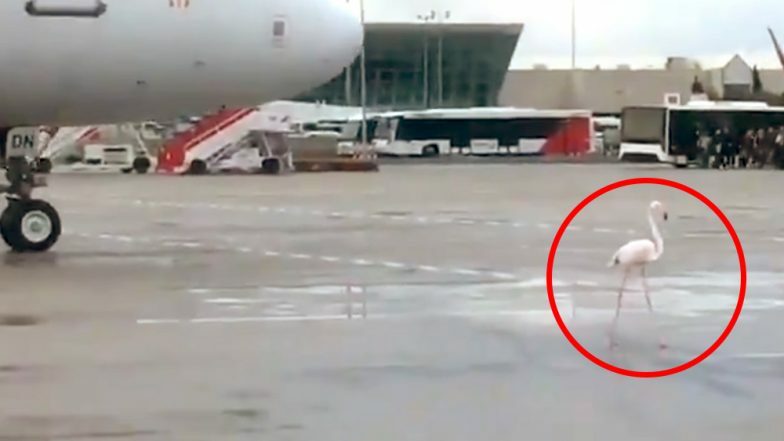 The video shows a flamingo taking a relaxed walk on the tarmac, not too far from the airplane. But the bird seemed unaffected by the big flight and continued to elegantly walk on the tarmac. In fact, once it shifted from the plane's path, it flew and tried to keep pace with the plane before it stopped and continued to walk again. The airport worker is heard saying, "We have a pink flamingo and it's no joke. An easyJet plane has had to brake." Saudi Plane Forced to Return Immediately After Take-Off As Mother Forgets Baby at Airport. The video is quite funny and is going viral with people obviously amused at the bird. Isn't it amazing how one flamingo slowed down an entire plane full of passengers? Well, as the Spanish air traffic controller rightly tweeted, "A flamingo received passengers arriving at Palma airport this morning. Very elegant, walking on the tarmac..." This incident did not pose any risks to the passengers as well. A spokesperson from EasyJet informed a news outlet that there were no delays and all the passengers were safe. The authorities even called the wildlife control department to remove the bird but by the time they came by, the bird had flown away.